In this two-week workshop, learn to kill those those bad habits that come with using tropes in fiction, and create a living, breathing world that surprises your reader and makes you stand out. In a publishing world where it seems like there are five hundreds books being released every day, how do you stand out? Lose the bad habits and laziness that come with using tropes in fiction, and create a living, breathing world that surprises your reader and makes you stand out amongst an army of your peers. In this two-week workshop, you'll learn just that: How to subvert your reader's expectations—because there's an art to it. You don't want to take things too far. You don't want to punk out at the last minute. And you don't want to lose the heart of your story. J. David Osborne is an acclaimed author and the editor of Broken River Books, which has published authors like Stephen Graham Jones, Adam Cesare, William Boyle, Michael Kazepis, and David James Keaton. And he has some ideas about the art of subversion. For example, instead of a dark noir taking place on the mean streets of the inner city, what if it was set in a church camp? Instead of a gunslinger walking into a saloon and getting into it with the scariest killer in the west, what if he becomes involved in a game of strip poker? Sounds simple, but the end game is leaving a lasting impression on the reader. Over the course of two weeks, Osborne will take a short story you've written, break it down into its basic components, analyze how the tropes have worked, and teach his personal methods for subverting expectations. The class will include a critique of your work, peer reviews, and opportunities for Q&A with the head of a rising publisher of crime fiction. And by the end of it, you'll have a story that makes good on the promise it started with. Though there are publishers out there that are looking for strict genre work, I think it's important for authors to take risks and play within the material, because whether or not they succeed, it will force them to dig deeper into the work, and it'll almost always turn out for the better. 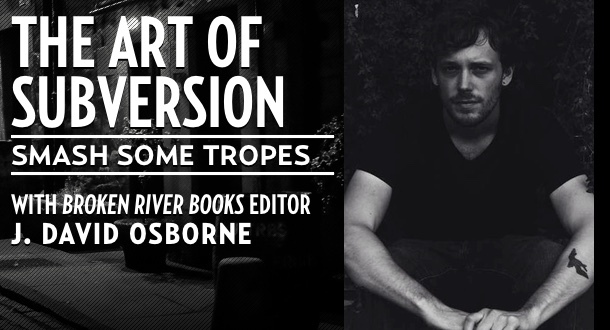 Osborne will discuss the types of submissions he receives to Broken River on a weekly basis, and will outline what makes certain books stand out from the others. In particular, he'll be looking to show how following tropes within a genre does not equal familiarity with the material, but rather inversely, it shows discomfort, a lack of willingness to stretch the parameters of what can be done within that particular wheelhouse. Assignment: Submit a short story that you've already finished, or are in the process of finishing, and Osborne will critique it based on its confidence and its ability to genre-bend. Osborne will outline the books and films and short stories that do precisely what he's talking about: take a cliche and flip it on its head. He'll also return your stories and be available for questions. Stories will also be reviewed and discussed among students.